According to modern astrology the fourth house rules the father, and everything we inherit from our immediate family. 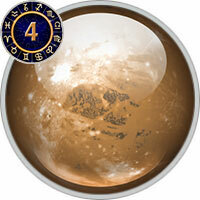 Pluto in the 4th house can show early intimidation. The father may appear threatening to the child, even if his behavior has unwarranted this powerful reaction. On the other hand, a fatherly figure may have had a profound affect on the individual growing up, and his absence leaves a gaping wound. Another possibility is that he had difficulty in expressing his emotions, suffered from deep depression, and when he erupted the violence of his reactions frightened them. The father may have been over-demanding, over-controlling, over-protective or even jealous. The 4th house can also signify the death of one of the parents, or actual abandonment. The death of a family member often impacts the child deeply. Perhaps the parents may have been struggling to come to terms with a significant loss at home. The family may have been torn apart, lost its home, and suffered bankruptcy. Pluto here is often deeply private and secretive about their early life. One of the best outlets for this placement is to "dig up" the family history, and explore old secrets. However, there may also be a compulsive need to explore their "roots" forcing old issues out into the open, sometimes giving rise to power struggles, confrontations and upheavals.The complexes and traumas formed in early childhood, if unresolved, often seethe below the level of conscious awareness, and the individual carries a hefty weight of grief and resentment over old hurts. The individual with Pluto in the 4th house might want to cut off their feelings altogether, and it may feel as if something dangerous underneath threatens to overwhelm them. Pluto here represents heavy emotional baggage, which must be explored and healed. There may have even been something considered taboo about their roots and parentage, and the family might have been persecuted in the past. A parent’s paranoia, obsessive behavior or depressive moods, could have permeated the environment.This can all affect how you feel about family and living at home, and many are concerned with matters that rest deep within the soul. Those with this placement are interested in psychotherapy, counselling and all forms of healing that occur at the deepest level of the human psyche. They are very intuitive, behaving instinctively and like to get to the core of things. The person feels emotional or moody about the home, and buries themselves within its walls, and it could be a place they feel totally transformed and may view home as a place of destiny. Major home improvements could be on the cards and the home may be a place they feel resourceful and full of renewed strength. When Pluto is placed in the house of the home, they may want to relocate, emigrate, and utterly reinvent where they are living, or build a new place to live. This will usually happen when they feel they have outgrown a phase of their life. Often forces beyond their control tear them away from their past, but they will discover a renewed sense of belonging and transform in the process. Pluto in the 4th house may also be involved with tearing down old homes and rebuilding them. The home might have been badly damaged and in need of repair, and the situation often forces them to tap into their inner resources. Early experiences may have led you to feel self-protective or to be secretive about yourself. A parent might have been secretive or ashamed, for example, and this pattern is deeply ingrained in your psyche. You might feel a sense of guilt for where you came from, even if most of you feels proud of your roots. A parent might have encouraged you to look beyond the surface of matters, and might have encouraged in you a love for psychology. A parent might have been very protective of you and attempted to shield you from negative experiences, and you subsequently grew to fear change. Or, your early experiences might have included a shocking, intense, or scary event that lives within you. Alternatively, you might have absorbed the strong fears or obsessions of a parent.